Some time ago I posted saying that I’ve been winding lots of coils and since then I also mentioned that I started work on a set of 5B4AGN filters and some of those was shown here. Since then, I’ve completed a full set of low pass filters for my WSPR/QRSS transmitter and here they all are. These are for all bands from 160m through to 10m, including 60m and arranged in band order from left to right. I’ve become quite good at winding these coils now. The performance of them all is superb and you can see from the following plot how well they work. 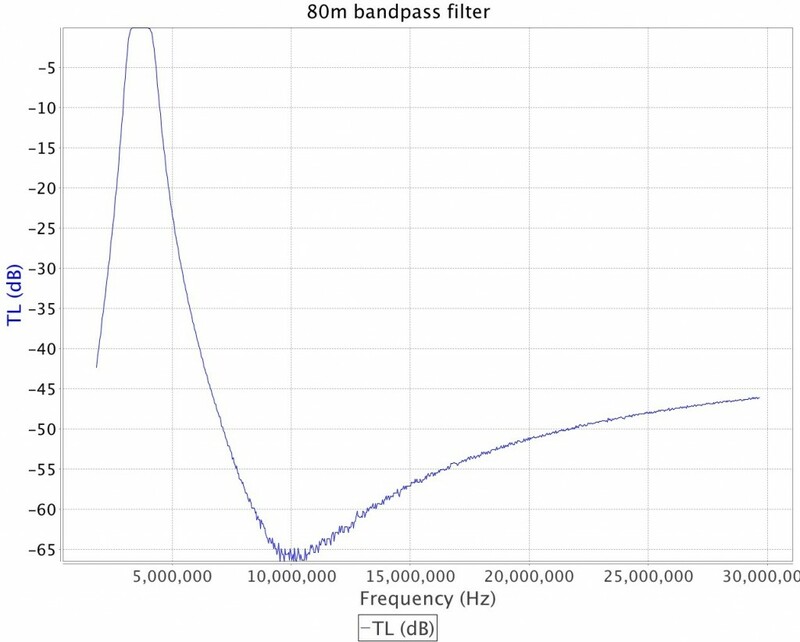 The 80m filter provides around 47-48dB attenuation on 40m, greater than 50dB of attenuation on 20m and about 50dB of attenuation on both 15m and 10m. It’s clearly very good for keeping the output signal from the transmitter nice and clean. However, these filters are designed for use in the U2 transmitter and are really only good for QRP work. I’ve also finished winding all the coils for my 5B4AGN bandpass filters. Just winding them has been difficult and I spent a couple of frustrating days winding, unwinding and rewinding them in order to get them all done to a standard I was happy with. Here’s the coils all ready wound for the 80m bandpass filter. The red wire is 1mm and the copper coloured wire is 1.25mm. Both of these wires are quite difficult to manipulate so sore fingers are certainly the order of the day after doing a lot of winding. Over the past few weeks I’ve been slowly getting these bandpass filters boxed and tuned with the help of Richard, G7HJK and Colin M1EAK. Colin has drilled all the holes in the boxes and as I don’t own an oscilloscope, Richard has done the setting up in his workshop. 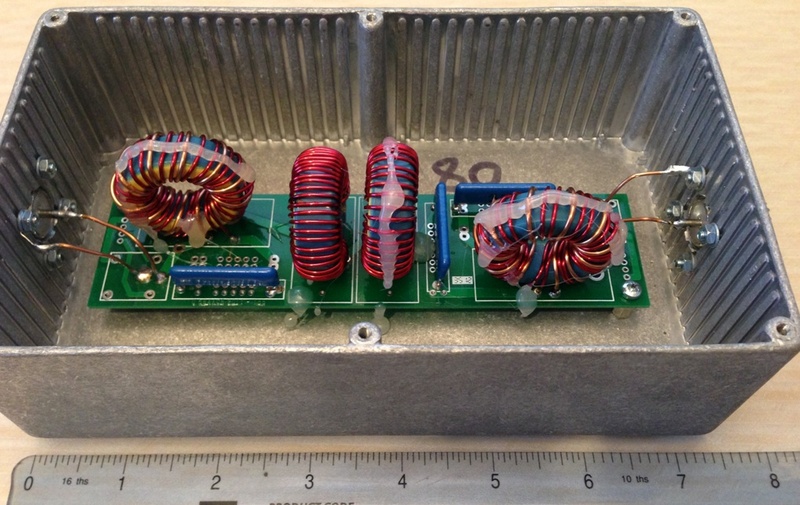 Here’s the 80m bandpass filter all boxed up with a ruler next to it to give an indication of size. 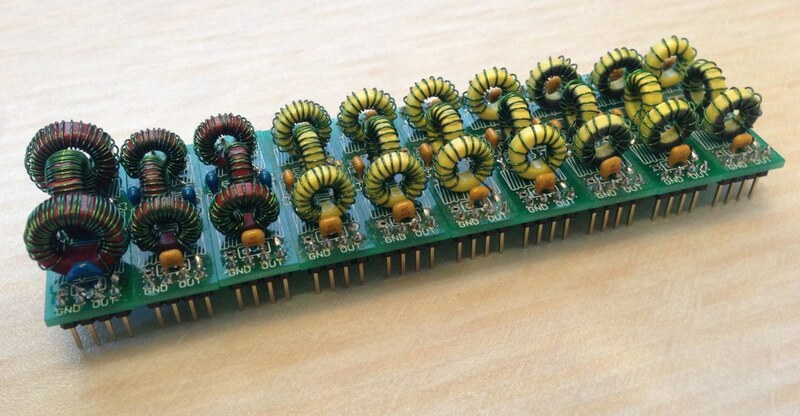 These filters are somewhat more chunky than the first ones described in this post and are good for well over 100w of SSB. 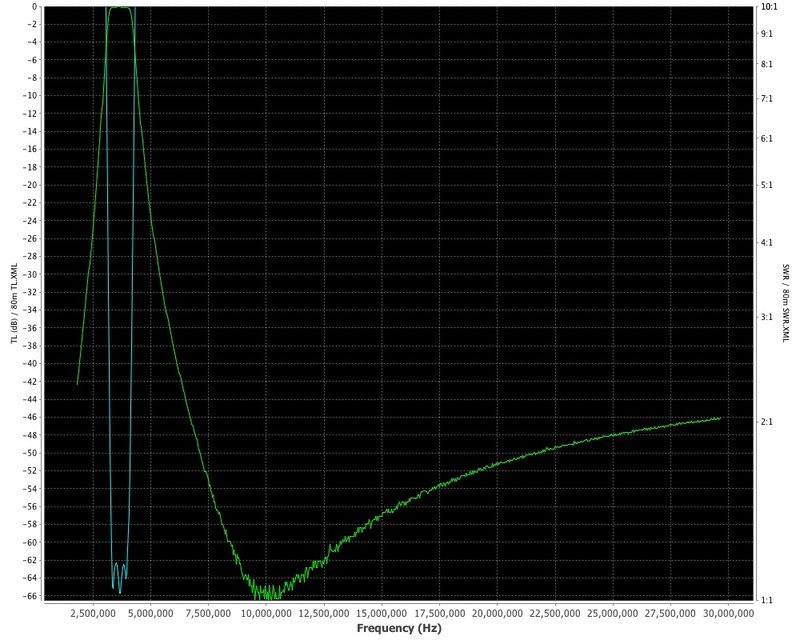 Here’s a slightly different plot showing rejection (TL – transmission loss) and SWR for this filter. And here’s the transmission loss (rejection plot) from 1,800 kHz to 29,700 kHz. This shows around 47dB of attenuation on 160m, 52dB attenuation on 40m, 59dB of attenuation on 20m, 51dB attenuation on 15m and 46dB attenuation on 10m. The figures for the other filters are similar with significant rejection on all the other amateur bands. It’s not clear to see from either of these plots but the attenuation within 80m is around 0.1dB so very little of the actual wanted signal is lost. The main reason for building these bandpass filters is to take to Herm as part of the GP0PKT DXpedition in October this year where we’re going to be running three stations simultaneously. Good filtering is essential to be able to do this and with a filter on each station, we should be OK. I chose to build them rather than buy them because the performance of these homebrew filters is superior to the commercial models available which only offer 40dB of band-to-band rejection and they’re significantly more expensive at around £90 each. To buy all the parts needed to build these bandpass filters works out at just over £40 each. Plus, it’s a lot more satisfying to build something that’s cheaper and better than the equivalent commercially available product. Finally, some people may not be familiar with the difference between a low pass filter and a bandpass filter. 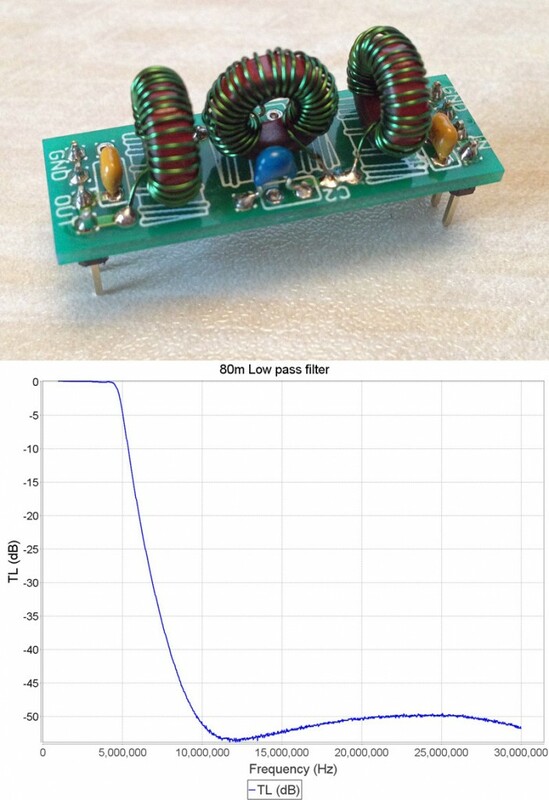 A low pass filter passes everything below the desired frequency, if you see the plot of the 80m low pass filter above and the 60m low pass filter in this post, you’ll see that the line is flat at all frequencies lower than the desired band. A bandpass filter not only filters out frequencies above the desired band but below it as well, it’s only allowing frequencies through on the desired band – It’s only passing one band, hence ‘bandpass’ Compare the 80m low pass filter and the 80m bandpass filter plots shown above and it will be more clear.